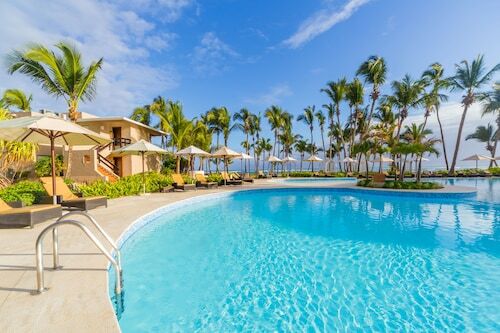 A guilt-free vacay that gives you everything you want? 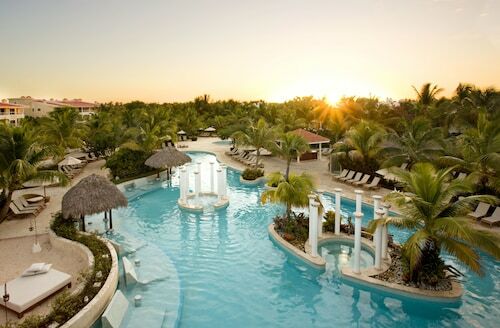 It’s called an all-inclusive hotel, and you shouldn’t wait one more day to start booking. Get accommodations, food, beverages, amenities and activities, all for one affordable price. Save on your hotel when you book here, now. 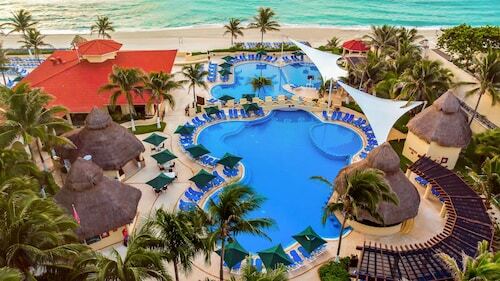 Set in tropical seclusion on a 2-mile private Caribbean Sea beach, Finest Playa Mujeres by Excellence Group - All inclusive is within a 25-minute drive of downtown Cancun and the airport. 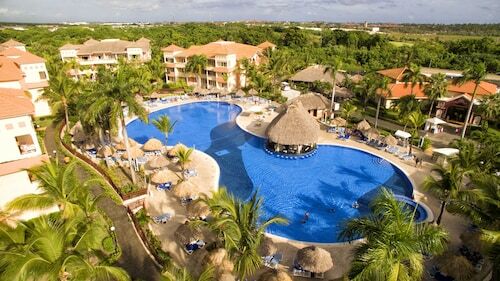 Beloved Playa Mujeres by Excellence All Inclusive AdultsOnly is steps from white sand lapped by the Caribbean. 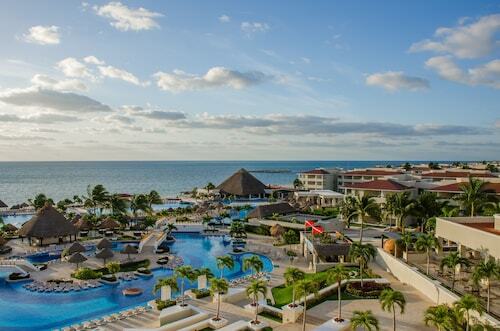 It’s an 8-minute walk to Playa Mujeres Golf Club (surcharge), and a 20-minute drive to the El Meco Mayan ruins. Guests can catch a boat at La Amada Marina (surcharge) and be browsing the shops on Islas Mujeres within 40 minutes. Located in Puerto Morelos, this beachfront property is next to a golf course and within 12 mi (20 km) of Ventura Park Cancun, Delfines Beach, and Petempich Bay. Cancun Country Club and El Rey Ruins are also within 12 mi (20 km). 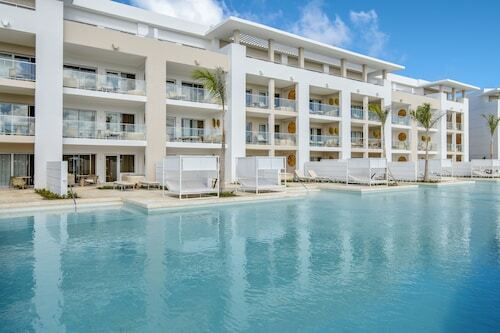 Nestled on the beach, this Costa Mujeres property is within 9 mi (15 km) of Las Americas Cancun Mall, Market 28, and Puerto Cancun Marina Town Center. Plaza Las Americas and Langosta Beach are also within 12 mi (20 km). This Costa Mujeres property is on the beach, 1 mi (1.6 km) from Playa Mujeres Golf Club, and within 6 mi (10 km) of Punta Sam Ferry Terminal and El Meco Archaeological Site. Garrafon Natural Reef Park and Gran Puerto Pier are also within 9 mi (15 km). 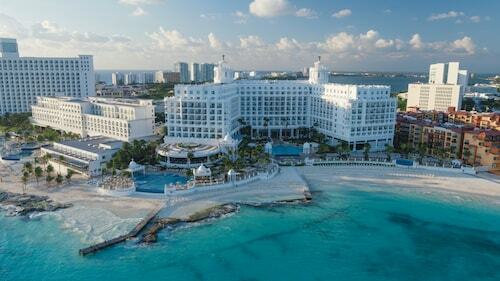 Situated in Cancún's south shores, Moon Palace Cancún - All Inclusive is within 10 miles (16 kilometers) of downtown Cancún, the Mayan ruins of El Rey, and Ventura water park. Located in Playa Mujeres, this beachfront property is next to a golf course and within 3 mi (5 km) of Punta Sam Ferry Terminal, Playa Mujeres Golf Club, and El Meco Archaeological Site. Norte Beach and Garrafon Natural Reef Park are also within 6 mi (10 km). 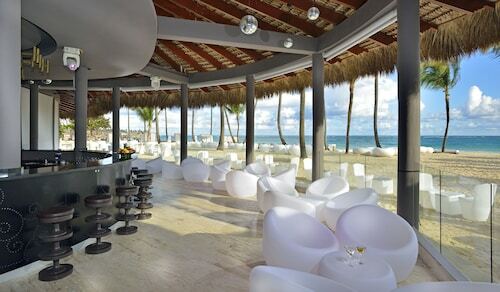 Located in Zona Hotelera, this spa property is steps from Gaviota Azul Beach, Forum Beach, and Caracol Beach. 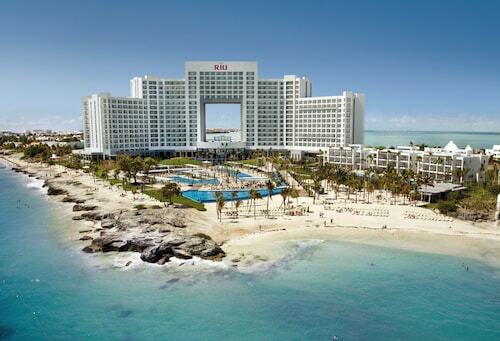 Cancun Convention Center and Delphinus Dreams are also within 5 minutes. Nestled on the beach, this Zona Hotelera property is just steps from Gaviota Azul Beach and Delphinus Dreams. Forum Beach and Caracol Beach are also within 5 minutes. Located in Costa Mujeres, this beachfront property is next to a golf course and within 9 mi (15 km) of Playa Mujeres Golf Club, Punta Sam Ferry Terminal, and Gran Puerto Pier. 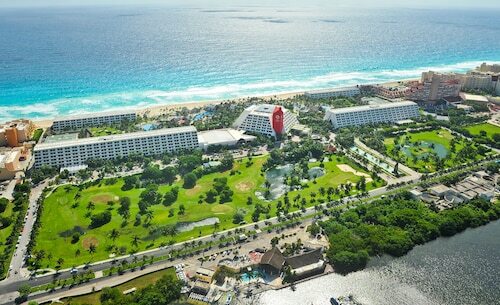 Puerto Cancun Golf Course and Las Palapas Park are also within 12 mi (20 km). 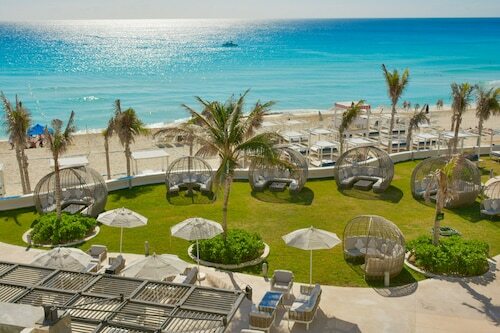 Nestled on the beach, this Zona Hotelera property is within 3 mi (5 km) of Delfines Beach and Aquaworld. Ventura Park Cancun and Cancun Interactive Aquarium are also within 6 mi (10 km). 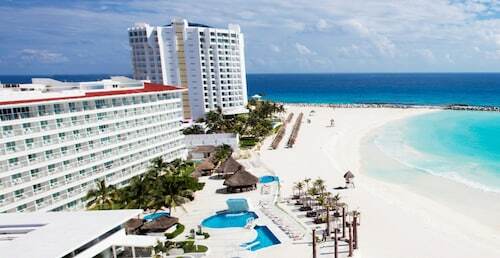 Featuring ocean view or oceanfront rooms and suites, facing a white, powdery sand beach and brilliant turquoise water, this oceanfront resort is just minutes from The Cancun Center and main shopping and entertainment areas. Located in Zona Hotelera, this beachfront property is in the city center and within a 10-minute walk of Delfines Beach and El Rey Ruins. Aquaworld and Maya Cancun Museum are also within 3 mi (5 km). 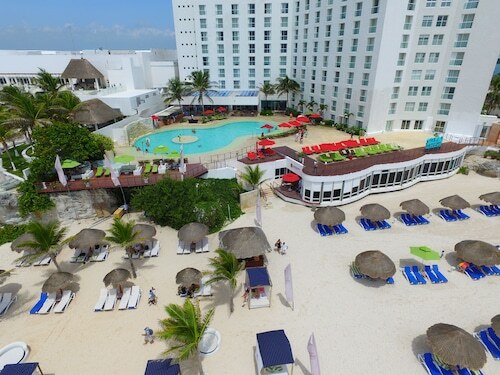 GR Caribe By Solaris Deluxe All Inclusive Resort is on the beach in Cancun’s Hotel Zone, 15 minutes’ drive from the airport and 30 minutes from downtown Cancun. The Mayan El Rey ruins are a 15-minute drive away, as is La Isla Shopping Village. 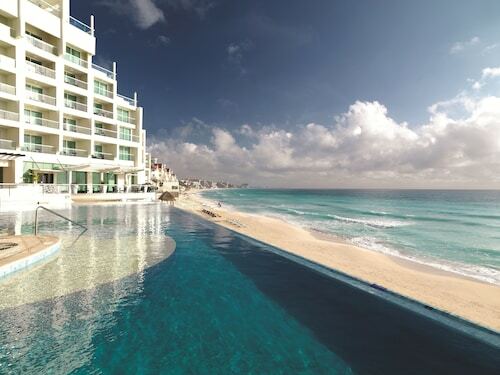 Nestled on the beach, this Zona Hotelera property is within a 15-minute walk of Maya Cancun Museum and Aquaworld. Delfines Beach and El Rey Ruins are also within 2 mi (3 km). This Costa Mujeres property is on the beach, 1 mi (1.5 km) from Playa Mujeres Golf Club, and within 6 mi (10 km) of Punta Sam Ferry Terminal and El Meco Archaeological Site. Garrafon Natural Reef Park and Gran Puerto Pier are also within 9 mi (15 km). This Playa Mujeres property is on the beach, 0.8 mi (1.3 km) from Playa Mujeres Golf Club, and within 9 mi (15 km) of Gran Puerto Pier and Las Americas Cancun Mall. Market 28 and Dubai Palace Casino are also within 12 mi (20 km). 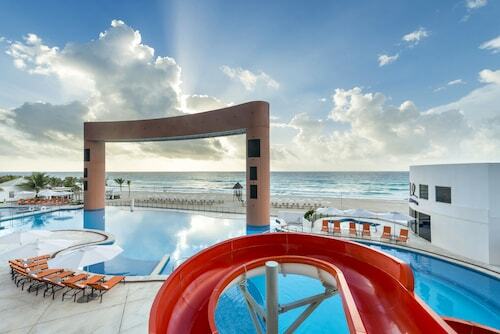 This family-friendly Cancun property is located in Zona Hotelera, within 1 mi (2 km) of Aquaworld and El Rey Ruins. 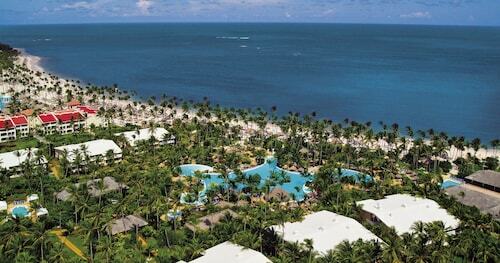 The Riu Palace Peninsula All Inclusive resort stands right on a private white-sand beach lapped by turquoise water. Ferries to Isla Mujeres leave from a terminal a 12-minute drive away. Nestled on the beach, this Costa Mujeres property is within 12 mi (20 km) of Las Americas Cancun Mall, Market 28, and Plaza Las Americas. Galenia Hospital is 10.2 mi (16.4 km) away. Nestled on the beach, this Zona Hotelera property is just steps from Jardín del Arte and Langosta Beach. Tortuga Beach and Turtle Beach are also within 1 mi (2 km). A slice of Spain on the Caribbean is on display at Riu Palace Las Americas All Inclusive - Adults Only, in the heart of the hotel zone and near shops and night clubs. 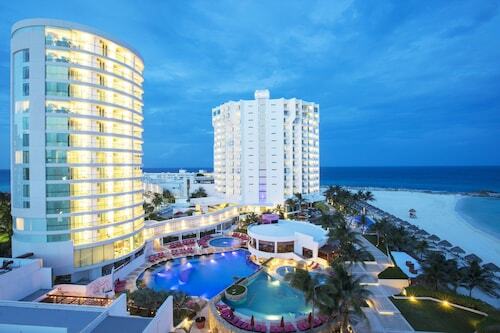 This beachside resort is 8.5 km (less than 6 mi) from downtown Cancún. 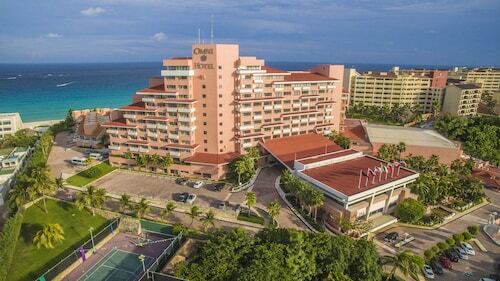 Nestled on the beach, this Zona Hotelera property is within a 10-minute walk of Yamil Lu'um Archaeological Zone and Cancun Interactive Aquarium. La Isla Shopping Mall and Forum Beach are also within 2 mi (3 km). 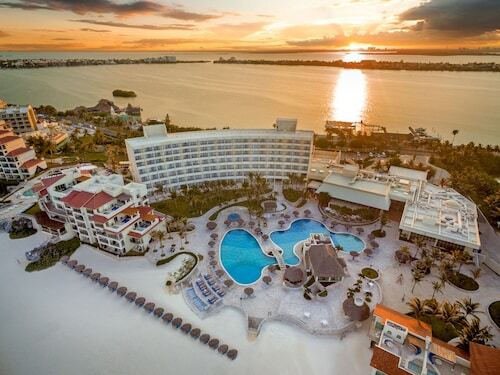 This couples-only all-inclusive beachfront resort is 5 km (3 mi) from downtown Isla Mujeres and less than 10 km (6 mi) from downtown Cancún. Garrafon Natural Reef Park is only 1.5 km (1 mi) away. 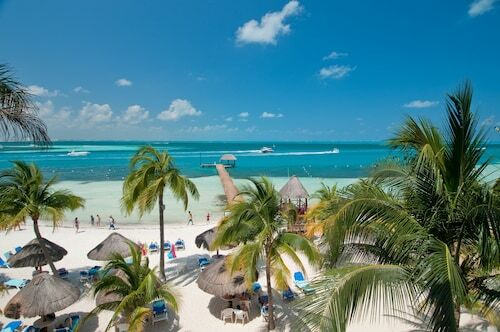 A tiny island itself, this quiet resort on a long beach forms the northern tip of Isla Mujeres, a 30-minute boat ride from Cancún; North Beach is an 18-meter (20 yard) waist-deep wade away. With direct access to the beach, this Punta Cana property is within 3 mi (5 km) of Punta Blanca Golf Course, Hard Rock Golf Club at Cana Bay, and Arena Gorda Beach. 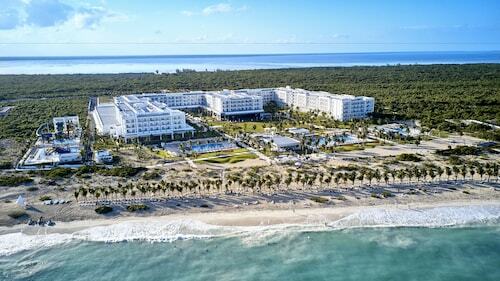 Iberostar Golf Course and White Sands Golf Course are also within 6 mi (10 km). 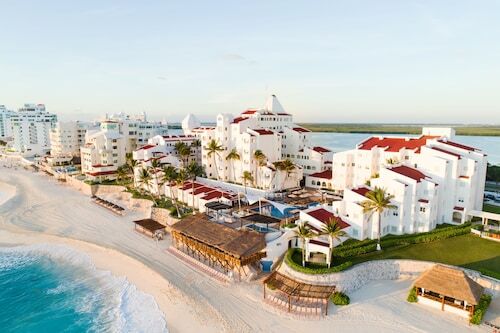 Exclusive service for families with special amenities and activities, luxuriously appointed Family Concierge Suites, Paradisus kids beach kit, turndown service, and personalized Concierge assistance. 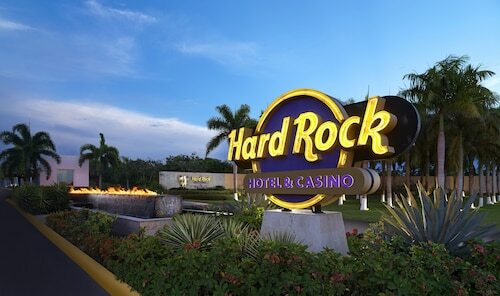 Located in Punta Cana, this beachfront property is next to a golf course, 1.1 mi (1.7 km) from Arena Gorda Beach, and 2.2 mi (3.5 km) from Hard Rock Golf Club at Cana Bay. Punta Blanca Golf Course is 1.7 mi (2.7 km) away. 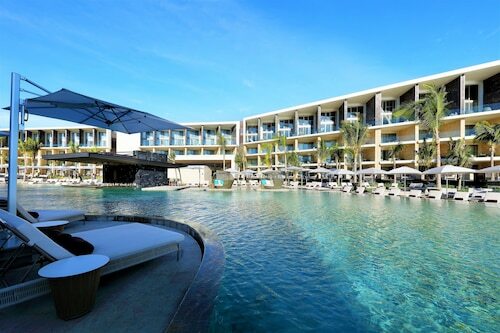 The Reserve is a luxurious boutique resort located in Paradisus Palma Resort just 25 minutes from the Punta Cana Airport and right in front of Palma Real Shopping Village and Cocotal Golf Club. Located in Punta Cana, this beachfront property is next to a golf course and within a 15-minute walk of Los Corales Beach and Palma Real Shopping Village. 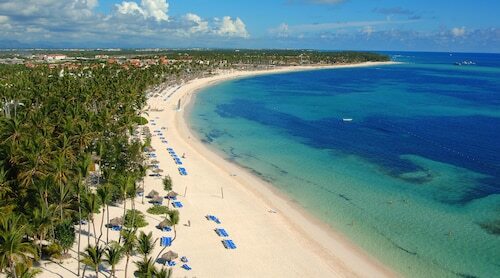 Bavaro Beach and Dolphin Island are also within 3 mi (5 km). 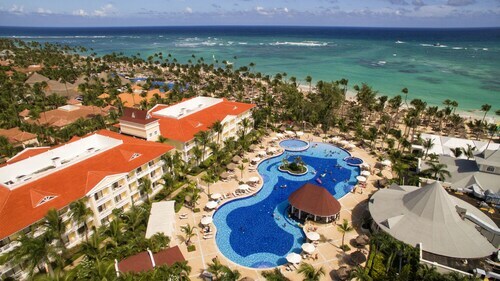 Iberostar Grand Bavaro Adults Only - All inclusive is located in beautiful Punta Cana Beach, in the Dominican Republic. 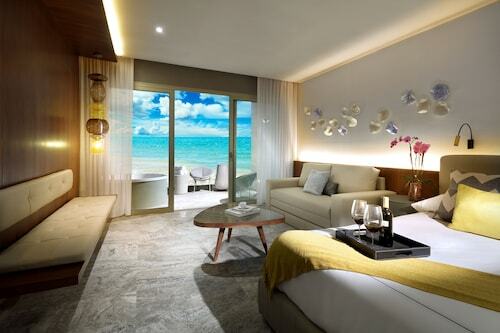 Bathed by the waters of the Caribbean Sea, designed for an exclusive tourism seeking luxury vacation. 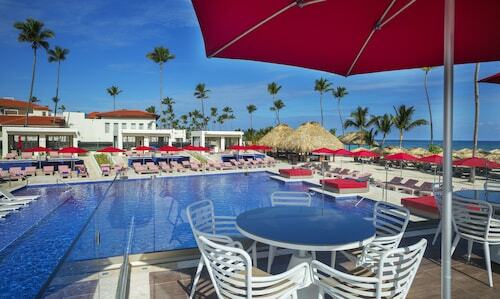 Situated in Punta Cana, this all-inclusive property is within a 10-minute walk of Aromas Museum and Los Corales Beach. Cortecito Beach and Palma Real Shopping Village are also within 2 mi (3 km). Nestled on the beach, this Punta Cana property is within 2 mi (3 km) of Los Corales Beach, Bavaro Beach, and Palma Real Shopping Village. Dolphin Island and Cortecito Beach are also within 3 mi (5 km). 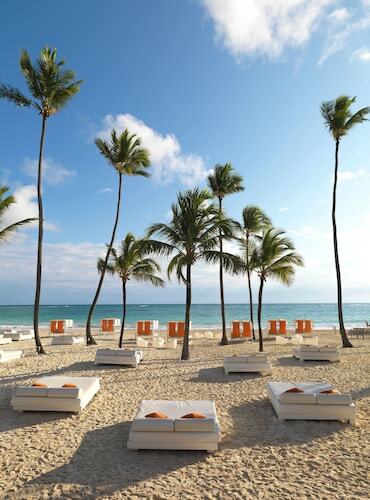 This Punta Cana property is on the beach, 5.1 mi (8.3 km) from Macao Beach, and within 12 mi (20 km) of Arena Gorda Beach and Hard Rock Golf Club at Cana Bay. Iberostar Golf Course and Punta Blanca Golf Course are also within 12 mi (20 km). This Ramón Santana property is on the beach, 5.1 mi (8.3 km) from Cueva de las Maravillas National Park, and within 12 mi (20 km) of Cave of Wonders and Estadio Tetelo Vargas. La Romana Port and El Obelisco are also within 20 mi (32 km). 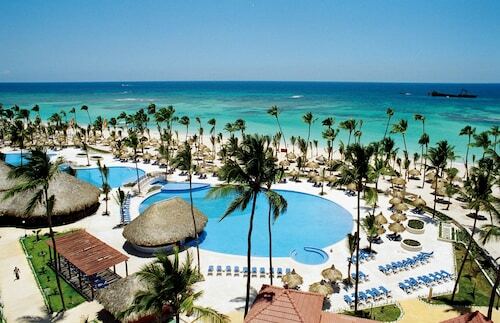 The Riu Palace Punta Cana is situated on a white-sand beach within the Riu Resort Complex. Guests have exchange privileges at 2 nearby sister properties. With direct access to the beach, this Punta Cana property is next to a golf course and within 2 mi (3 km) of Los Corales Beach, Bavaro Beach, and Palma Real Shopping Village. Dolphin Island and Cortecito Beach are also within 3 mi (5 km). 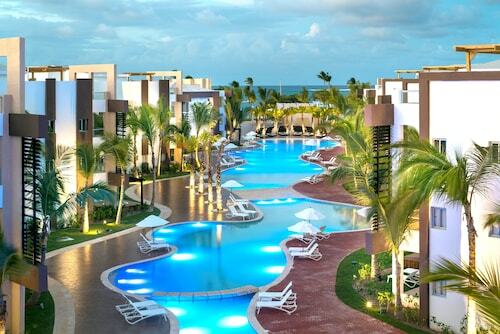 This all-inclusive property is situated in Punta Cana. 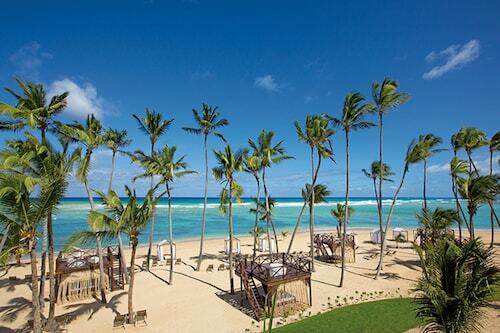 Another area point of interest is Bavaro Beach. Nestled on the beach, this Punta Cana property is within 12 mi (20 km) of Macao Beach, Hard Rock Golf Club at Cana Bay, and Arena Gorda Beach. Cortecito Beach and Los Corales Beach are also within 20 mi (32 km). 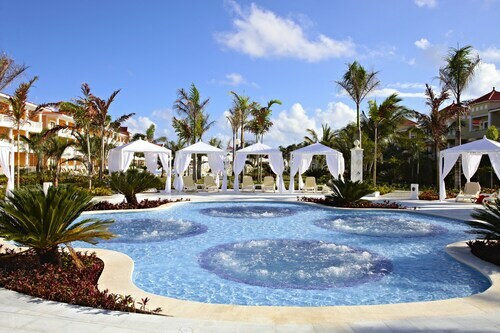 Nestled on the beach, this Punta Cana property is 0.4 mi (0.6 km) from Arena Gorda Beach and 2.1 mi (3.4 km) from Hard Rock Golf Club at Cana Bay. Punta Blanca Golf Course is 1.6 mi (2.6 km) away. Nestled on the beach, this Punta Cana property is within 12 mi (20 km) of Macao Beach, Hard Rock Golf Club at Cana Bay, and Arena Gorda Beach. 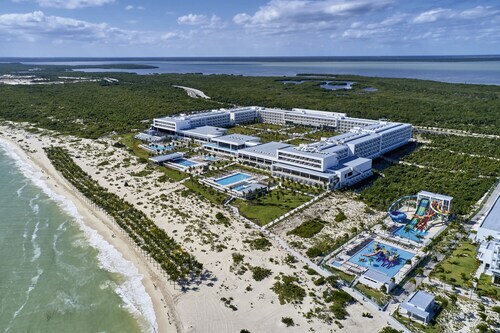 Iberostar Golf Course and Punta Blanca Golf Course are also within 16 mi (25 km). 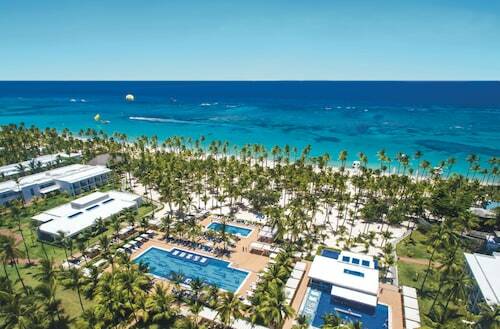 Located on Punta Cana's Bavaro Beach, this all-inclusive resort offers access to the white sands of Costa del Coco. Guests enjoy unlimited access to Cocotal Golf & Country Club. 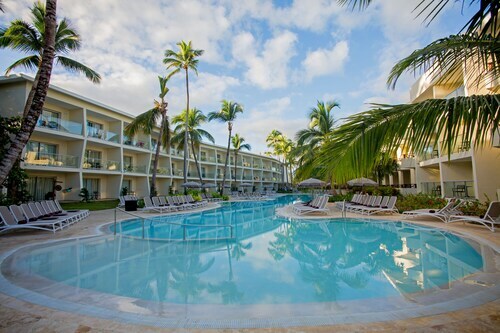 Situated in Punta Cana, this all-inclusive property is within a 15-minute walk of Aromas Museum and Cortecito Beach. 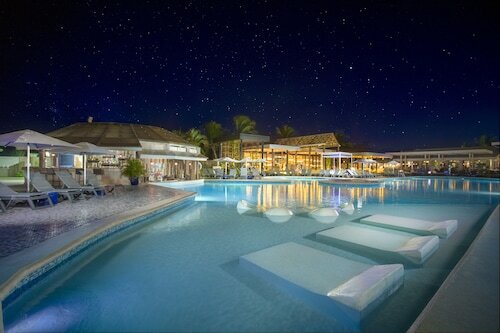 Los Corales Beach and Palma Real Shopping Village are also within 2 mi (3 km). Nestled on the beach, this Punta Cana property is within 3 mi (5 km) of Punta Blanca Golf Course, Arena Gorda Beach, and Hard Rock Golf Club at Cana Bay. Iberostar Golf Course is 2.8 mi (4.4 km) away. 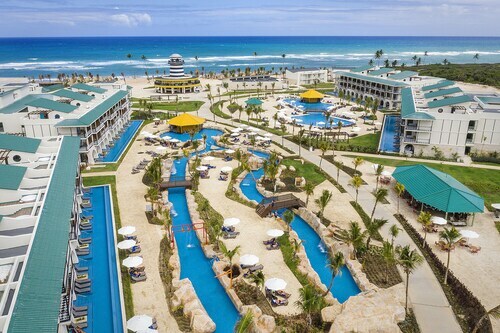 Ocean Sand Beach Resort All Inclusive has 708 guest suites, two swimming pools, casino, 7 restaurants, and 9 bars. 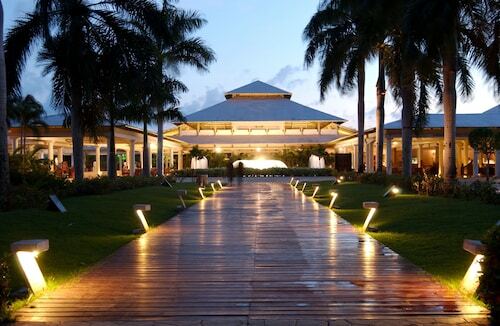 Located on a white-sand Caribbean beach with calm and clear waters, this resort is set amid lush tropical gardens. 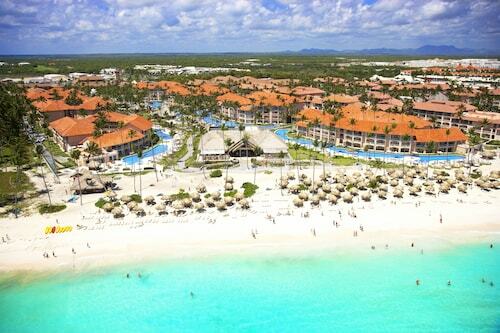 Going to Punta Cana Golf Club is a 5 min ride and the airport is just 13 miles (21 kilometers) away. 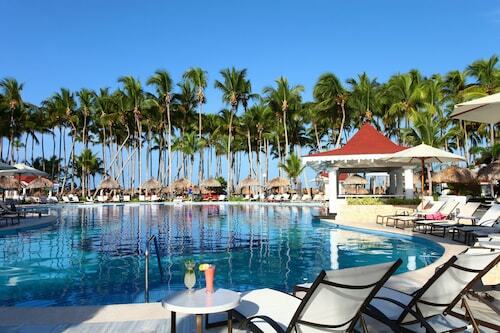 Situated on the Dominican Republic's easternmost beach just north of where the Atlantic Ocean meets the Caribbean Sea, this property sits next to Catalonia Royal Bavaro and the exclusive Pearl Beach Club Punta Cana where guests receive a discount. 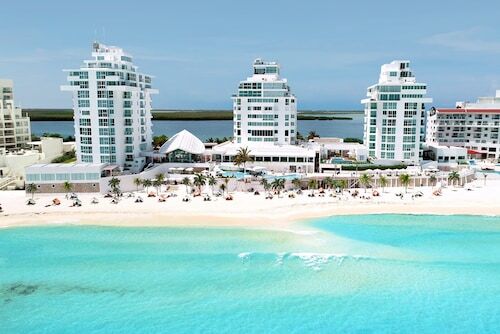 This resort includes a casino and an 18-hole golf course. Green Fee is included. Located in Punta Cana, this beachfront property is next to a golf course and within 3 mi (5 km) of Bavaro Lagoon, Downtown Punta Cana, and Dolphin Explorer. Cabeza de Toro is 2.8 mi (4.6 km) away. 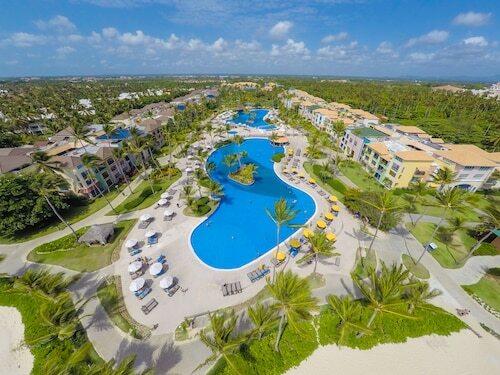 Luxury Bahia Principe Esmeralda - All Inclusive sits on the beach in Punta Cana, 5 minutes from the Punta Blanca Golf Course and White Sands Golf Course. 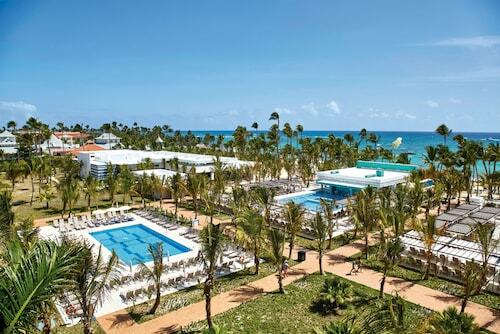 Surrounded by palm groves and facing the white sands of Arena Gorda Beach, this Punta Cana resort is in the Riu Resort Complex. Guests have exchange privileges at 3 nearby sister properties.